I was born in Boston, while my father attended MIT, but raised in Milwaukee, where my parents were both born. I moved to Santa Barbara in 1987 and graduated from UCSB in 1990. 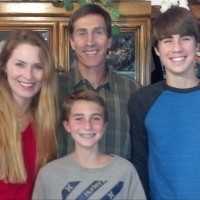 I’ve been married for 21 years to Greg Robertson, and we have two wonderful sons, Chase- 16 and Bryce- 13. I spend most of my time taking care of them, but also enjoy outdoor activities, like hiking, biking, swimming & running stadiums at SBCC. Recently, I’ve started an amazing indoor workout at Barre3 Studios which encompasses ballet, Pilates and yoga. Reading is my other favorite indoor activity. I just discovered audible.com, so now I can “read” anytime while doing almost anything! I also enjoy playing board games or seeing movies with my boys, when they’ll let me. Finally, I greatly enjoy Bible studies, prayer groups & hanging out with family and friends, especially at Bible studies & prayer group’s. I feel blessed to have the opportunity to lead the woman’s ministry and am excited to see where He takes us.